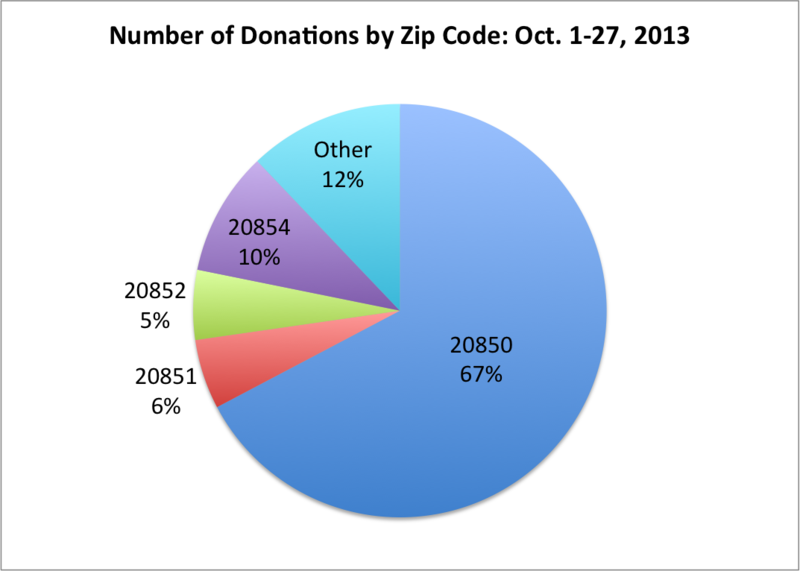 The second campaign finance reports for the Rockville Mayor and Council elections for the period October 1-27, 2013 were recently submitted and they reveal that Zip Code 20850 (includes Fallsgrove, West End, New Mark Commons, East Rockville, Lincoln Park, College Gardens, King Farm) still dominates the contributions and even increased their giving by 5 percent compared to September. The other Rockville Zip Codes fell far in the distance at 10 percent for 20854 (Horizon Hill, Fallsmead, Potomac Woods); 6 percent for 20851 (Twinbrook); and 5 percent for 20852 (Hungerford, Montrose, North Farm). For the entire election season, 20850 is tops at 63 percent, contributions outside the city come in at 21 percent, and the other three Zips stand at about 5 percent. Again, that roughly mimics the voting records for those regions and perhaps how much they feel engaged with the larger Rockville community. Don Hadley: $500 FCN, Inc. Although Zip Code 20850 provides a majority of the support for each of the candidates, the balance varies considerably. Feinberg and Palakovich Carr have the greatest diversity, with a significant percentage of donors from the other Rockville Zips. Whitaker stands at the opposite extreme, with no financial support from Zip Codes 20852 or 20854. 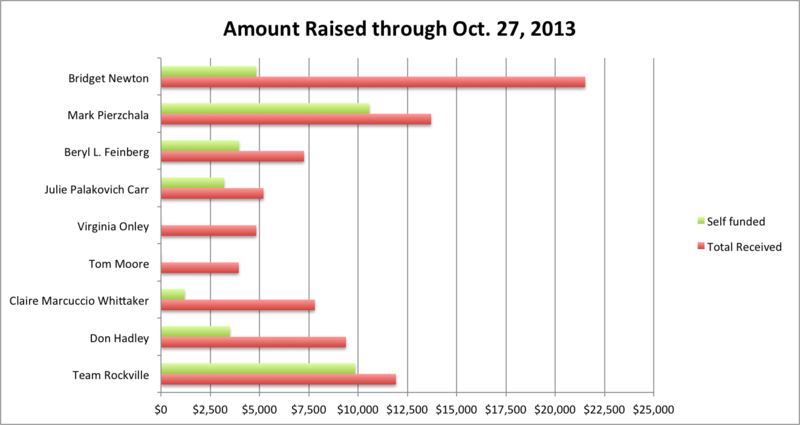 It’ll be interesting to see if the voting patterns mimic the funding patterns. For example, Twinbrook (20851) gave most of their financial support to Feinberg and Palakovich Carr but will they also turn out at the same rate on Election Day? My analysis provides an introductory overview to the money involved in the current election. I encourage you to examine the campaign reports to determine if candidates are honest and fair or subject to undue influence by a certain faction or interest. At the Board of Supervisors of Elections meeting on October 30, they noted several inconsistencies in reporting such as the accounting for PayPal, totals from one page didn’t agree with another, and one candidate had several contributions reported in the second period rather than the first. After some discussion whether these were minor or serious problems, they seemed to agree they were minor because the information could be found with little effort.